Are you looking for an electric vehicle that uses your pedal power and electric assist (with solar charging!) to replace in-town trips usually done by car? If so, you should check out the Organic Transit ELF. Organic Transit recently caught my eye because they have designed a neighborhood electric trike that falls within the guidelines of an electric bike. At 750 watts of power and a max speed of 20mph (with electric assist only), it technically can go anywhere a conventional bicycle can. And that is a great benefit to places that have a lot of bike path networks. The ELF has a 60 watt solar panel on the roof that can recharge the 480 watt hour lithium ion battery pack! You can also plug the ELF into a wall outlet for recharging. Errands are accomplished with storage room for 8 bags of groceries and 350 lb of cargo capacity. Organic Transit claims 30 miles of range on the stock battery pack, but the range can be increased with more battery packs. Currently the price for the ELF is $4,000. These are currently being assembled in Durham, North Carolina! Organic Transit is planning on creating 1,000 ELF’s in a month and then replicating that process at factories all over the world; as they put it “bike factories in a box”. I am really excited about a pedal/electric vehicle like this, but I also have some concerns. One of my concerns is the width of these trikes. On a wide bike path or lane it is probably fine, but if it is traveling on a narrow neighborhood street I could see there being more of an issue considering that this vehicle will mainly travel around 20 mph, which is below most neighborhood street speed limits of 25-30mph. On one hand car drivers may wait more to pass instead of just blowing by, but that may not be the case for some impatient drivers. 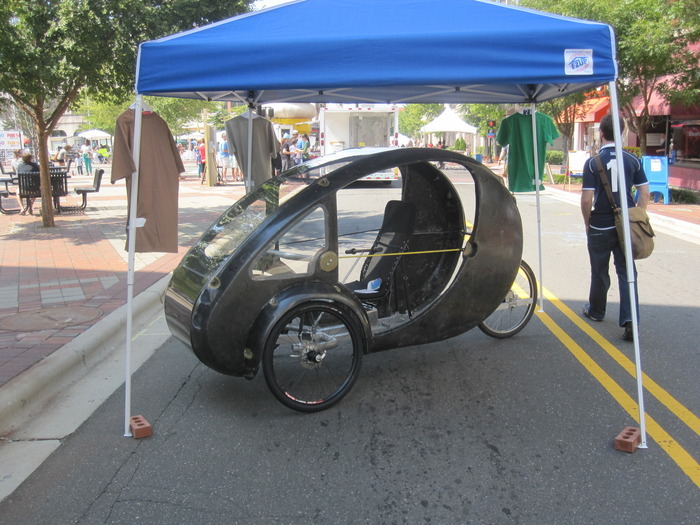 It seems like this type of trike that travels around 20 mph (you can pedal faster) may have trouble fitting into the current infrastructure of some towns and cities. Don’t get me wrong, I am all for a vehicle of this type, but it may be limited to certain routes. We need vehicles like this to replace small in-town trips that are normally accomplished by a car. The challenge is designing them fit into the current infrastructure. If the max speed is increased to fit the flow of automobile traffic then this type of vehicle would not be able to travel along the bike paths & lanes, it would need to be designed for a crash at higher speeds (heavier design), and it would need to be licensed, insured, etc. With a heavier vehicle, the human pedal power and solar charging would be less effective in the overall propulsion, so it becomes more of an electric plug in vehicle. Again, these are all tough design constraints, and I think Organic Transit is doing a good job to create a car alternative pedal/electric vehicle. Make sure you checkout their KickStarter campaign if you are interested in buying an ELF and/or if you want to support their business plan. Organic Transit will also be producing a similar type of vehicle meant for deliveries, “The Truckit“. What do you think? Will this type of pedal/electric vehicle work in your town or city’s infrastructure? Please leave your comments below. Check out Wilderness EV in Utah; the have a reverse trike that also has a solar panel roof. 45mph & 40 mile range. It sells for $800 more, licenses as a motorcycle and, IMHO, would be a far more practical choice. Yes, you’d meed motorcycle endorsement on your driver’s license, but c’mon – how easy would it be to take the test with this? I do the search for the Wilderness EV, I don’t see anything that will do 45 mph, without a big hill! How about a link Steve? I agree with your concerns about the ELF not fitting into the current bike profiles. Putting a body on it raises some concerns as to how it is accepted by just about everyone. I have seen similar bikes in the past and the public gets confused rather easily as to what it is. If it looks like a car..ie..SMART…it could be treated like one. E Bikes are gaining acceptance because they look like bikes. For those who commute by bicycle there’s the dilema of limiting our riding to only on the nice days and comfortable seasons or toughing it out when the weather becomes colder and more challenging. With an Elf bike/trike commuting year round suddenly beomes a possibility. Vehicles like the ELF push the boundaries of acceptance. In reality it’s just a trike with a roof. If you watch the video of the ELF on the promotional site you see it being pedaled down a sidewalk. But, on narrow bike paths the joggers and walkers may well think a car just invaded their space. As much as anything – what may need to change is how we view one another as we find more economical and year-round convenient modes of transportation. To soon for this concept. If it becomes popular then hold on to your hats for the uproar from pedestrians, bicyclists and drivers. Good idea for China and retirement communities. I commend him for his innovative spirit. America is and always will be about cars (until the government bans them). This is a great idea. Is it a pedelec. What motor is he using? Is it a Panasonic or Bosh and what is the wattage? I don’t think this bike will be welcome on city roads. I think the Government might want it licensed. Hi Alroy, I’m hoping to have more detailed specs for you soon. I’d like to know more about the materials, components, and frame of the trike itself. Love the idea of the shell, etc. The idea is fantastic but i dont know if the public is ready to accept these trikes on the road. Cops will issue tickets thinking its an automobile. People will complain about seeing them on bike paths and on roads. Also how do you lock it up and protect it from theives? Its a great concept but it might be ahead of its time. Can they sell enough to be profitable? probably not. While I have been talking & writing about it, and indulging myself with toys that utilize the technology: these guys have been doing what should be done. That said: I would like to speak out in favor of hub motors & regenerative braking. Particularly on cargo-hauling EV’s. The inertia to be harvested from a 130 lb rider on an 8 lb bike is not worth harvesting. The inertia to be harvested from a 300 lb rider carrying an additional 50 lbs on a heavy enough bike to hold up to the load is worth harvesting. There is a niche for mid-drive; it is a great way to go, but hub motors with regen have their value too. we put our deposit down. finally a reasonable vehicle for around town.! – this vehicle is made in the USA, in fact it is currently manufactured less than 8 miles from where I live! – the actual final vehicle is something my spouse can and will drive! – our kids (early high school and sophomore in college) actually think it is cool!! OK, it is very likely that the cost can come down, the range will go up, etc. But for the same reasons I was the 2nd Toyota Prius owner in this part of NC, I believe time to put my money on a type of transportation I am proud to talk about with my friends and neighbors! I’ve had my Elf for about a month and have had no negative reaction whatever from the motoring or pedestrian public. I get waves and smiles, and when I park it, I’m surrounded by folks asking all kinds of questions, folks taking photos, and really interested recumbent riders wanting to try it out. Unfortunately at 48 inches wide I think they made it to wide to be practical for driving like a bike on the side of the road. I was thinking of buying one but the more I read about it not being accepted in cities and towns and bike trails I’m leaning more toward maybe the e-fox which is 32″ wide which is more in line with adult trikes . I have an adult trike with a hub motor and it’s about the max width I would care to ride on the side of the road , emergency lane or whatever. Not sure of why they made it so wide and didn’t think about that because it does look cool but I think it would interfere with cars. I think cars would have a hard time getting around them without stopping and waiting for the cars in the other lane to go by. its simply the best . In eastern TN, we need gearing for hills. Mid drive with the 1 hp max permitted to retain “bicycle” designation for license and insurance would probably work, Will probably need moped type drive components for durability.. We have courteous drivers here, that will wave and say hi as they run you off the road. Limited number of bike lanes.